Some images below may make you green with envy and others might give you a zigzag head ache – but ALL of them should inspire you to take risks when packing your suitcase for Holiday travels. Oh Lord - won't you buy me a Chris (topher) Benz...my friends all wear Chanel, I must make a mends. Yes, it is loud - but what else do you expect from Missoni? I really wish I would have had this look for South Africa! More from Missoni. Love the pants - but I think they need to be paired with a basic tank. The fringe number is a little much for those of under 6 feet tall and weighing more than 100 lbs! Doesn't every sunbather need a pink parasol? 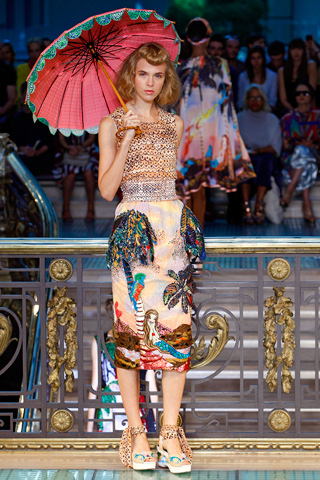 While overall this look from Tsumori Chisato is a bit over-the-top - but as separates, I think the parasol and the skirt are darling. 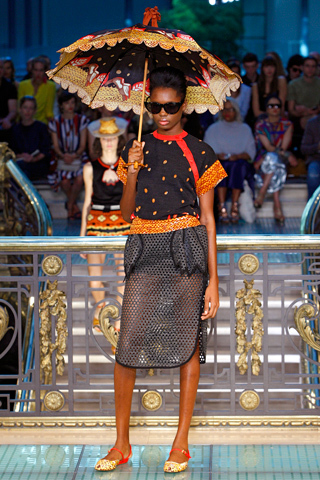 Another OTT (over-the-top) look with matching parasol from Tsumori Chisato. For the less girly girl type. Mark Fast wasn't quite fast enough getting this to the runway...This would have been perfect for Mozambique! This little Stella McCartney number is fun, flirty and fitting for a coastal destination. All images courtesy or http://www.style.com. If you wear that around resort islands like Bali, Indonesia.. Damn you will be the eye candy of the town. haha. Explosive colours! !